As an international guide, chef and founder of Uncommon Adventures, Michael Gray knows a thing or two about outdoor cooking. He maps out your best meal ever under the open sky. I’ve been guiding wilderness trips, mostly by kayak, for 28 years. 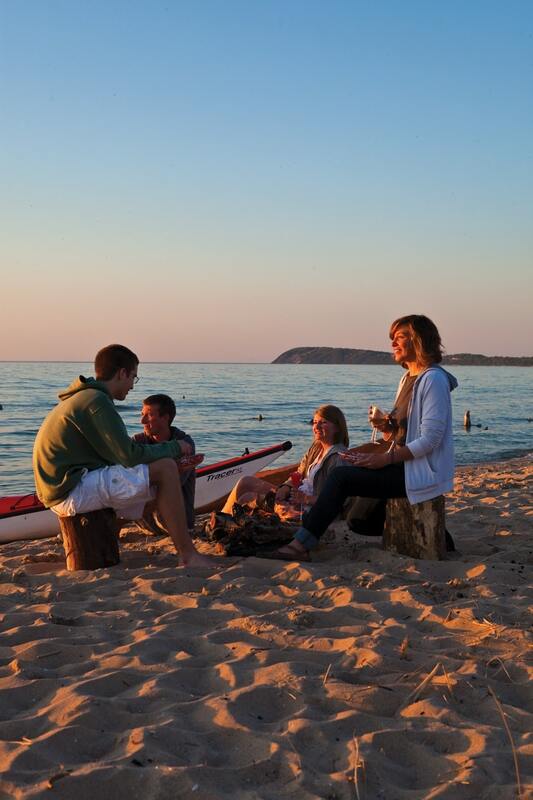 Whether my clients are paddling in Alaska, New Zealand, Patagonia, Honduras, Florida’s Everglades or here in my cherished home waters of the Great Lakes, they all share one thing in common: eating well. In recreation and in our daily lives, so many things are beyond our personal control … gas prices, bugs, weather, just for starters. But what and how we eat is almost entirely up to us, and over the years, I’ve found good food—food that’s both physically and sensually satisfying—is an essential tool on an outdoors trip. Food can even be safety gear (forget the chocolate and things start to go wrong). There’s something about that moment of sharing remarkable food in an exceptional place that says “BE HERE” like nothing else can. Each region I lead trips to offers its own food traditions built around what farmers grow and raise there. I find that incorporating local foods and food traditions into travel always results in a much deeper and more personal experience. That is as true here in Northern Michigan as it is anywhere else I’ve ventured. We have fabulous local resources to create memorable dishes. Sure we have some of the world’s best cherries and Rieslings up here, but we also have family farms that produce cheeses and a variety of livestock as well as a bounty of fruits and vegetables. From my front door in Benzie County, I can walk to buy organic greens, ice cream made with local strawberries, local maple syrup and crisp asparagus from Ware Farm organic growers. I’ve always provisioned trips from local fare as much as possible. It’s not out of some recent political sensitivity or marketing effort. I just like it better … always have. I have the best job of anyone I know. I make a living out of helping people experience the world from the waters that give us life, and I get to share great food with them. Teaching outdoor cooking classes has kept me hopping to schools and symposia all over the world. Favorite all-time meal? Traded three trout to share a chunk of beef cooked on a farm disc over a fire with some gauchos in Patagonia. I just happened to have a Malbec in my pack. I’m still an explorer at heart … Lewis and Clark? I would have been all over that trip. But of course, a wonderful thing about gourmet food cooked outdoors is you don’t have to launch a grand excursion to get it. 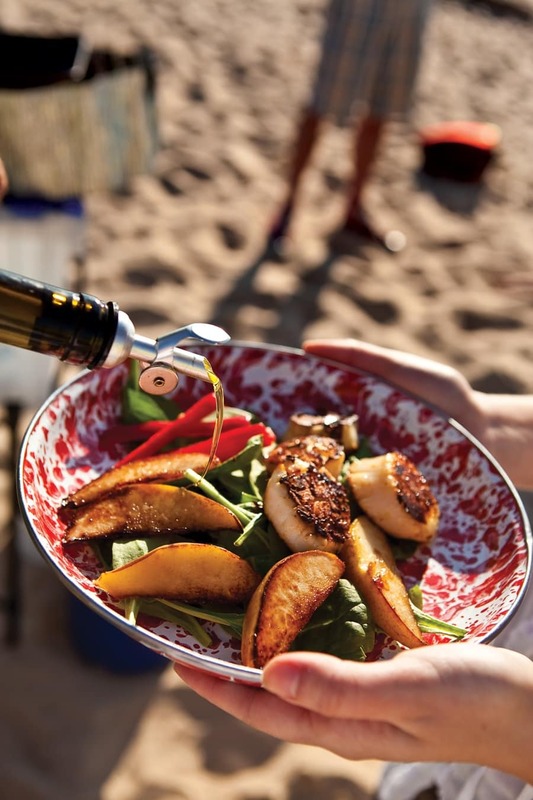 A public beach and a stop at good markets en route will give you the ingredients you need. 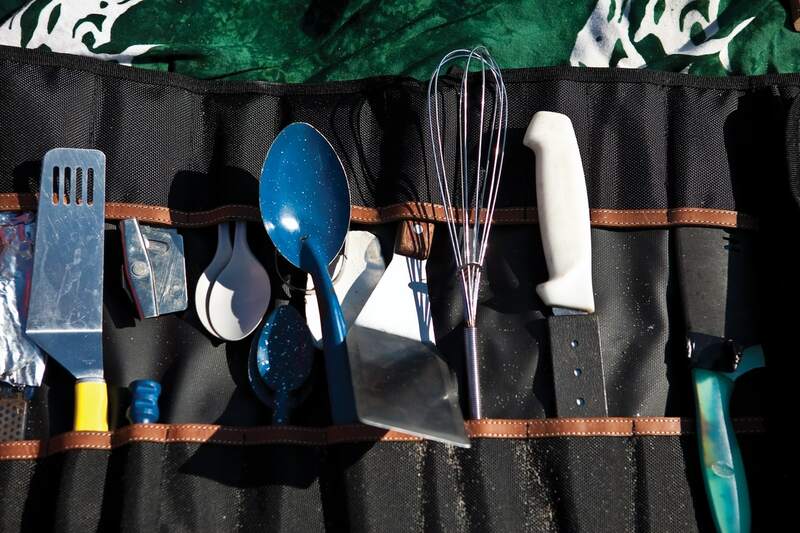 Here I lay out the recipes and tips for what I guarantee will be one of the best meals you’ve ever had outdoors, whether you’ve paddled 100 miles or walked 100 feet to reach your party spot. Pack a good spice kit. Fresh herbs are portable and most flavorful. Wrap uncut herbs in a damp paper towel and then package them loosely in a cellophane-lined paper coffee bag (the type you buy coffee beans in). Kitchen shears work well to cut sun-dried tomatoes. Heat management: use a heat diffuser plate on the stove burner to avoid burning and a foil windscreen around the stove to retain heat under pots and pans (conserves fuel). Small micro-fiber kitchen towels are lightweight, easy to clean, and work as hot pads, top insulators, napkins, placemats, and even … well … towels. Wine adds flavor to a number of dishes and is available in small Tetra Pak containers or Mylar bags inside paperboard boxes. Leave the box behind and you have an easy-to-stow package of wine. Hey, I’d Eat This at Home! 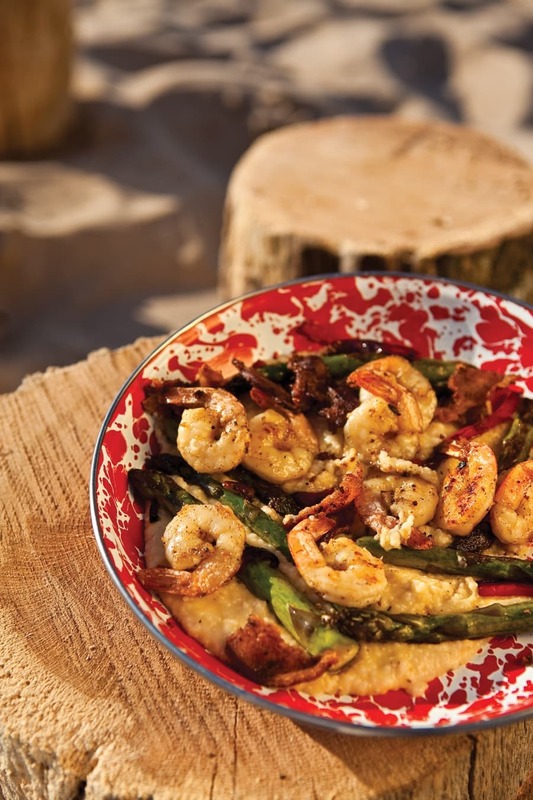 This outdoor cookbook includes more than 100 recipes (including some below!) 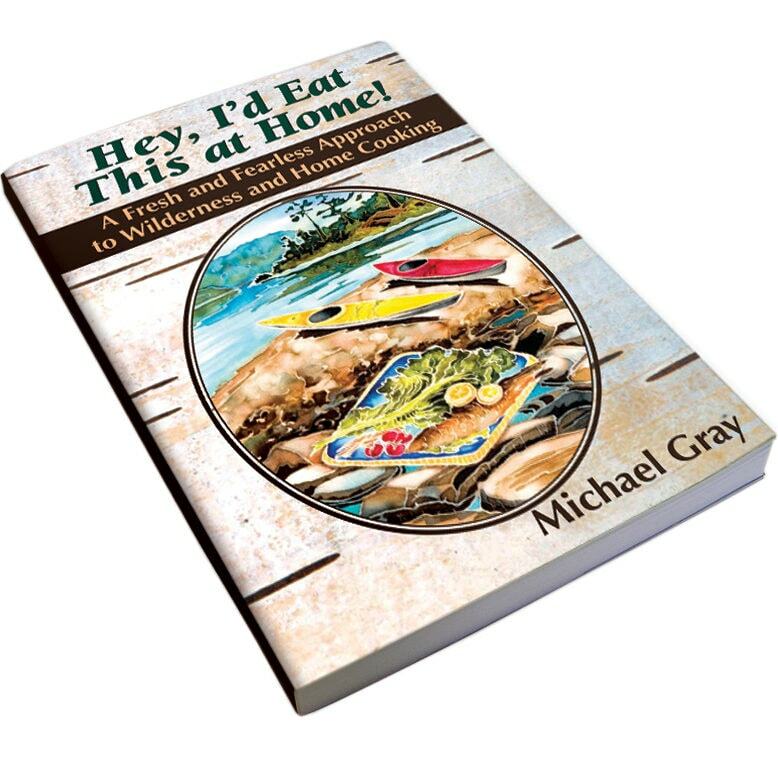 trail tested by Michael Gray during his nearly 30 years of guiding and exploring the world through food culture.To be enjoyed inside as well as out! Find the book online. 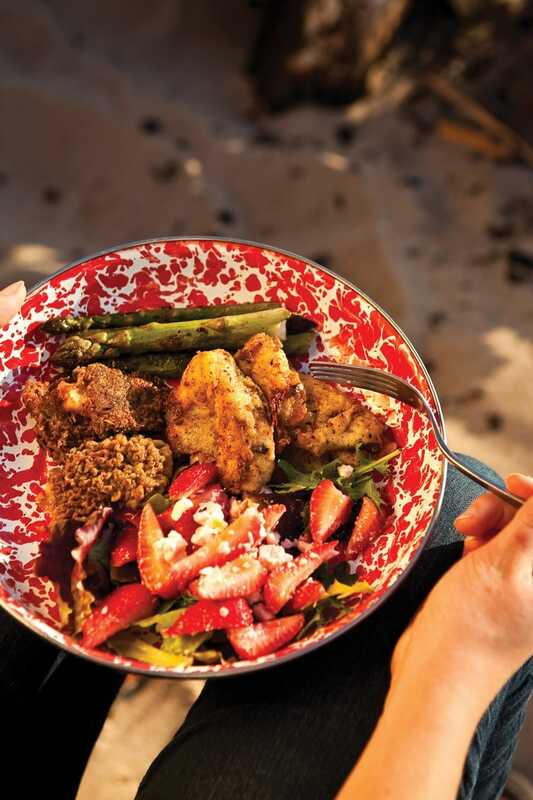 Couldn’t be easier … halve the cleaned strawberries and gently mix them with the feta. Dress with a few tablespoons of unflavored olive oil and white balsamic vinegar (again, try Fustini’s Peach-infused white for this). Serve on a bed of greens and you’re set to go. Get a sauté pan going on gentle heat with a tablespoon of butter melting. Add coarsely sliced leeks to flavor the butter. While this is sweating down, dust your soaked and halved mushrooms in a simple flour, salt and pepper blend. Turn up the heat a little, remove chopped leeks and lay your morels in a single layer in the flavored butter to brown. Turn mushrooms once until nicely browned and slightly crisp on both sides … drain on a covered paper towel. 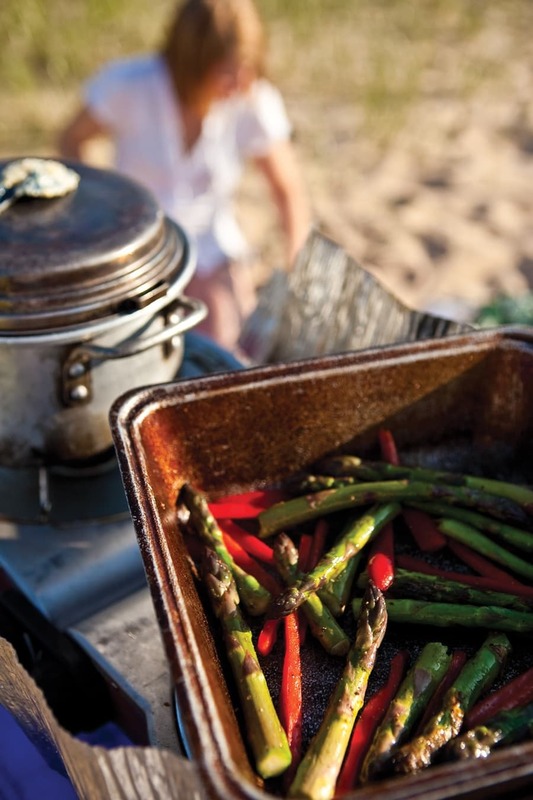 If you can multi-task, now is the time to put on another sauté pan on med-high to toast the asparagus spears in a little olive oil (season with pepper and sea salt). While that is going on, add just a bit more butter and a little olive oil to your mushroom pan and gently brown your fish filets on each side (dredged in the same flour mixture as the mushrooms). Serve the filets next to the sautéed spears topped with a stack of crisp mushrooms … a spiritual experience. (Note: Start shrimp marinating before starting polenta.) In a medium pot, bring chicken broth, mushrooms and evaporated milk to boil for polenta. Stir in polenta, reduce heat a little, and stir often. (Begin cooking shrimp.) When polenta starts to thicken (about same time shrimp is finishing)—add salt and pepper and taste. Continue stirring, and once polenta have reached the consistency of oatmeal, stir in Parmesan cheese. Peel and clean shrimp and marinade in a splash of olive oil, a tablespoon of lemon zest and four or five crushed gloves of garlic. In a second pot, sauté remaining garlic (minced) and chopped vegetables in olive oil for two minutes on medium heat. Add the thawed shrimp and sauté for 5 minutes in the garlic-infused oil. Remove from heat. Ladle a healthy serving of grits onto each plate, top with shrimp and vegetable mixture. Tabasco to taste—use enough and your grits turn pink. Black pepper, and salt to taste. For extra credit add crumbled bacon bits to the top! You may want to make a batch of sweet tea to go with this.